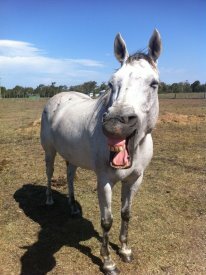 Bommer was surrendered after being abandoned on a property near gatton, he is a stock horse but sadly keeps coming up lame. At the moment he is under the care of specialists at Scenic Rim Equine Hospital as he is in foster care in Beaudesert and Ill post more details on his issues when we can establish them. He is only 9 years old and a beautiful boy.